These genius machines are perfect for single rooms. They come with user-friendly installation kits which would allow a hassle-free setup. They’re small and convenient, and can be moved around on floors from one room to another. Simply put, they’re good alternatives to window AC units, and this article is all about portable air conditioners. How to Install a Portable Air Conditioner? Usually, setting up a portable AC is no big deal. But it may vary from model to model, so you should take a look at the user manual before installation. Remember that it’s an air conditioner, and since it will get rid of warm air or moisture while trying to cool down the room, the air needs an exhaust system. The exhaust system should be set in another location, preferably outside. You can set that up with a window kit that comes along with a portable air conditioner. A window kit consists of an exhaust hose and a window slider that help remove the exhaust hot air into the outer premises. Some models can vent out exhaust air through a wall or into drop ceilings. Once your window kit is done and ready, plug your AC and check if it has started to cool down the room. If I had to sum it up, then I’d say that portable air conditioners work by pushing warm and moist air outside using a window kit, keeping the inner rooms cool. However, it’s pretty obvious that when the warm air is passed through the exhaust hose, there could be chances of condensation within. Different models of portable air conditioners handle this issue in different ways. By keeping the condensate water amount in check, a portable air conditioner can function for a long time. Self-evaporative models: These are the advanced versions of portable air conditioners, as they can evaporate the moisture away and out from the exhaust hose with the warm air. Thus, you would never have condensate water issues. 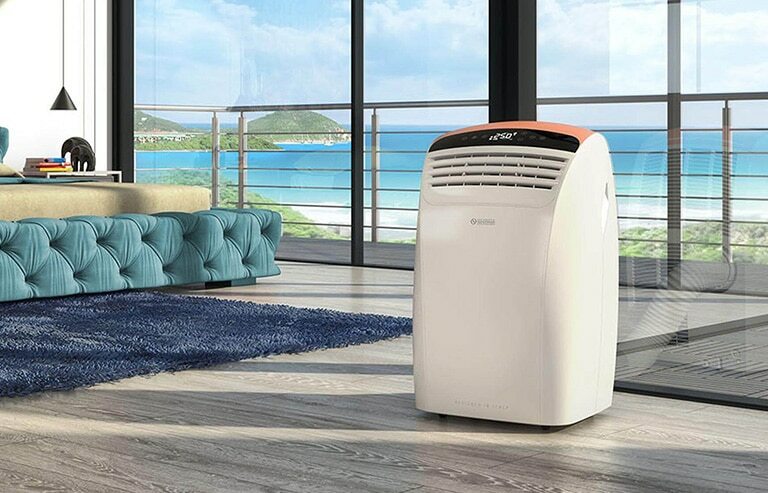 This gives portable air conditioners a much better advantage, compared to window air conditioners, which can get damaged over time due to condensate water issues. These models are very popular since there’s minimal hassle over a continuous long period of time. Condensate pump/ gravity drain: How do portable air conditioners work with attached gravity drains? Some models come with an additional drain hose that can get rid of the moisture that develops in the exhaust hose. The hose is attached to a port which redirects water to another location or a drain. Certain accessories, such as condensate pump can also be used, which drain out the condensed water through a hose to another location. However, the pump is recommended for use if the distance to the alternate location is long. Removal with Buckets: A general portable air conditioner would come with buckets that you would have to empty regularly. Depending on the model, you may have to remove the buckets every few hours or at least once a month. It also depends on the level of humidity and the time of AC use. How do portable air conditioning units work in this case? Once the water fully collects into the unit, turn off the AC and remove all water from the bucket. Replace the bucket with a new one and start cooling again. Still confused on how do portable air conditioners work? Don’t worry. Even if you don’t understand the mechanics, they’re still relatively easy to install and run, and require less maintenance compared to the window or split air conditioners. Your portable AC user manual will help you. Or you could ask any HVAC professional to help you with it. One thing that you should keep in mind is that the exhaust hose length should not be increased. It could cause overheating and damage and also void warranty, depending on the manufacturer. These calculations are just estimations. It would be wise to consider accurate calculations made by HVAC experts, depending on the size of your rooms and ceilings and the model of portable AC you own. Small rooms would typically require a portable air conditioning unit with a cooling capacity of 7000 to 10,000 BTUs. This size is ideal for offices, bedrooms, and small nurseries with the size of 300 square feet at most. Spaces of medium sizes, such as large bedrooms and living rooms (350 to 700 square feet) require a cooling power of up to 14000 BTUs. For larger, more commercial spaces such as those in factories, server rooms, event spaces, and manufacturing facilities, you would need portable air conditioner units with more than 14000 BTUs. You may need to consider using an air conditioner with a less BTU power if you’re living in colder regions or aim to use your AC only when needed, for example, in hot afternoons. If you live in a warm region you would need more BTU power. Sometimes the room itself matters. If the room has many heat-producing devices or allows sunlight to enter through multiple windows, it will be naturally warmer. For effective cooling, you’ll need a portable AC with more BTUs. Consult an HVAC technician to determine the size of portable air conditioner you need for your home. Portable air conditioners are inexpensive and require less maintenance, making them great for small spaces. However, their range of cooling is less and you have to move them around from one room to the next. They are also a bit noisy. In general, portable air conditioners require around 120 volts power. There’s usually no need for extra outlets and wiring. They do require significant levels of energy, so use circuits with caution and make sure you don’t use too many high energy consuming devices along with your AC unit. High power portable ACs in commercial settings usually don’t need wiring or special outlets. Portable ACs can only cool down the immediate close area, so don’t expect the cool air to run down the hallway or cool your other rooms. However, rooms next to each other with large openings towards each other may get some cooling effects. The cooling effect can be extended with fans for a certain amount of time temporarily. Now that you have a clear idea on how portable air conditioners work, hopefully, you won’t hesitate to buy one.